The firing of John McCallum as Canada’s ambassador to China represents an opportunity for the two countries to reset their relationship, according to a former diplomat. 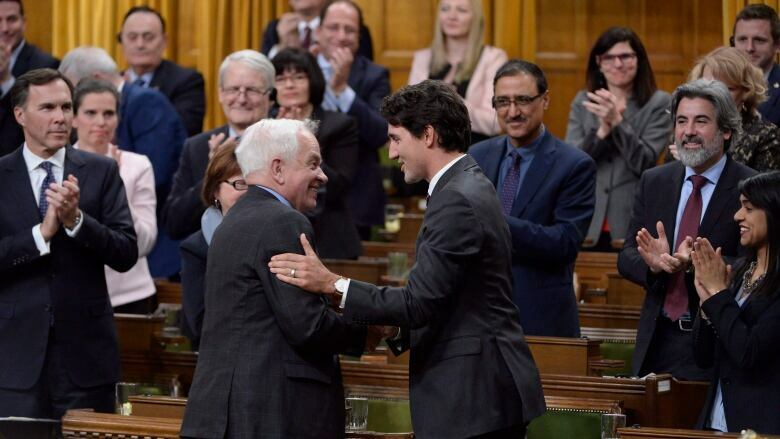 Prime Minister Justin Trudeau said Saturday that McCallum had been told to hand in his resignation hours after he was quoted saying it would be “great for Canada” if the U.S. dropped its extradition request for Huawei executive Meng Wanzhou. McCallum’s firing left Ottawa’s strategy for navigating tensions with Beijing in disarray; it came days after the former immigration minister and Liberal MP said he misspoke in telling Chinese-language journalists that Meng had arguments that could aid her legal fight against extradition. “It’s an opportunity to reset the relationship. We’ve now got the opportunity to put in a new ambassador,” Colin Robertson, former diplomat and vice-president of the Canadian Defence and Foreign Affairs Institute, said on The West Block on Sunday. However, the first priority is getting Kovrig and Spavor released and convincing China to mitigate the death sentence handed to convicted drug smuggler Robert Lloyd Schellenberg, Robertson added. In the wake of McCallum’s resignation, Jim Nickel, deputy head of mission at the Embassy of Canada in Beijing, will represent the country in China as charge d’affaires effective immediately, Trudeau said. But he acknowledged that, ultimately, Canada is in the middle of a spat between two far more powerful players in the U.S. — which is seeking Meng’s extradition — and China. “I don’t think much is going to happen until the China-U.S. relationship is sorted out and, of course, we’re through this extradition hearing with Meng Wanzhou,” Robertson said. Michael Le Couteur: So, where does this leave the Canadians caught in the crossfire in China? Well joining me right now is a former diplomat, Colin Robertson. Thanks very much for joining us. Colin Robertson: Good to be with you, Michael. Michael Le Couteur: So I guess the first question is the message to the families now of these detained, how are they to feel right now? 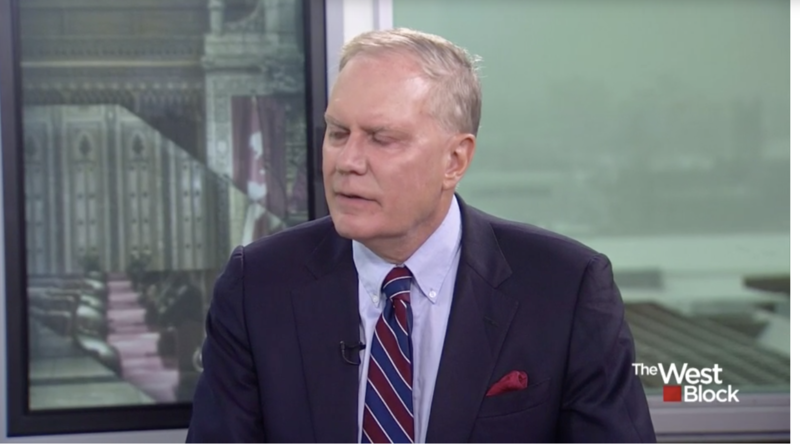 Colin Robertson: Well it’s the same, we’re—the Canadian government has got their back and our representatives in China and headed now by our chargé, who are making every effort to defend their interests and particularly getting access to them to report on the conditions they’re in. That’s got to be the concern of the families is how are their husband, brothers, and sons? Michael Le Couteur: But how do we now get that message back on track going forward with China? Because everything the Chinese have seen right now are two different messages: one from the prime minister and one from McCallum. How do we right this ship? Colin Robertson: Well the emphasis, once again, I think as we heard this morning, the government is doubling down on the rules based approach, which is exactly right. Because for a country like Canada, we need rules, especially when you’re a middle power to be able to deal with big, that’s what levels the playing field. So the rules based institutions and the rules based approach, which is at the heart of this whole extradition affair, is what we talk about, but it’s also an opportunity to reset the relationship. We’ve now got an opportunity to put in a new ambassador. I think we should also be pushing for a new Chinese ambassador because some of the comments that he’s made about white supremacy is just off the reservation and I think we impress upon the Chinese that we want to have a new—restart the relationship, but we probably need new quarterbacks in the field because frankly, we don’t—the Chinese didn’t necessarily trust Mr. McCallum anymore, or did he have the confidence of the prime minister, and we don’t trust, I think, the Chinese ambassador. So I think it starts with that. The alternative might be something like special envoys which are better to have ambassadors who you can trust and work with. Michael Le Couteur: But I mean resetting some of the players is a good plan, but so much of the game has already been played. How do we get anybody to forget the first three quarters of all of this? Colin Robertson: Well they won’t, but you go in with a new ambassador and perhaps an ambassador here and they engage. I mean it’s all about engagement. We think about sending over a ministerial delegation. We impress upon the Chinese that we’re prepared to engage with them. But first and foremost, we’ve got to be getting the two Canadians that we are detained, we think unfairly, out of jail and some sort of mitigation on the sentence of Mr. Schellenberg, although that would be different and that’s on a separate track. And then you get into the economic relationship and then the sort of broader interests as well. And remember, other countries are going to be watching how we’re handling this because they could be in the same position. In the same way—in a certain way, the Chinese are—you know, there’s this Chinese expression, you know, you kill a chicken to scare the monkeys. Well there’s a whole lot of monkeys, which are the Chinese sort of say look how we’re treating Canada. And so they will—that’s why they’re banding behind us because that’s why you’re getting the Brits and the Australians and everyone else because they could be in our position as well. Michael Le Couteur: How much more difficult will it be to smooth over relationships, especially with the Chinese? Because they are such a superpower, because of how traditional they are in relationships. Colin Robertson: Well the Chinese have interests, too, and I think they would understand they have people into China have gone off the reservation and they deal with them in a more summary fashion than Mr. McCallum’s been dealt with. So this doesn’t normally happen, but this is extraordinary even for Canada, but is an opportunity, as I say, to reset. But I think you need some new players, two new ambassadors and then with a clear goal to get the relationship back on track. Now, I don’t think anything much is going to happen until the China-U.S. relationship is sorted out and of course we’re through this extradition hearing with Meng Wanzhou. Michael Le Couteur: And just quickly, if you were to advise the prime minister what to do in the next couple days ahead. Does he have to call President Xi to go look, hey, sorry about all this, let’s reset? Colin Robertson: No. I think that we’ve got a chargé who will deliver a message. Well, I think Chrystia Freeland could talk to her counterpart. He may well pick up the phone to talk to his counterpart, the premier. Not the president, because the Chinese aren’t—the president won’t take it, again, their very particular minded. And just sort of say—and I think deliver the message. Okay, we’re going to be appointing a new ambassador fairly soon, we’d like you to consider something as well because we think this important relationship should get back on track. Michael Le Couteur: I appreciate your time. That’s all the time we have for you today, Colin Robertson. Thanks so much for joining us. Virtually every analyst says McCallum had to go for telling the media, not once but twice this week, that it would be better for Canada if Huawei executive Meng Wanzhou isn’t extradited to the United States. One slip-up could be forgiven. The second could not. 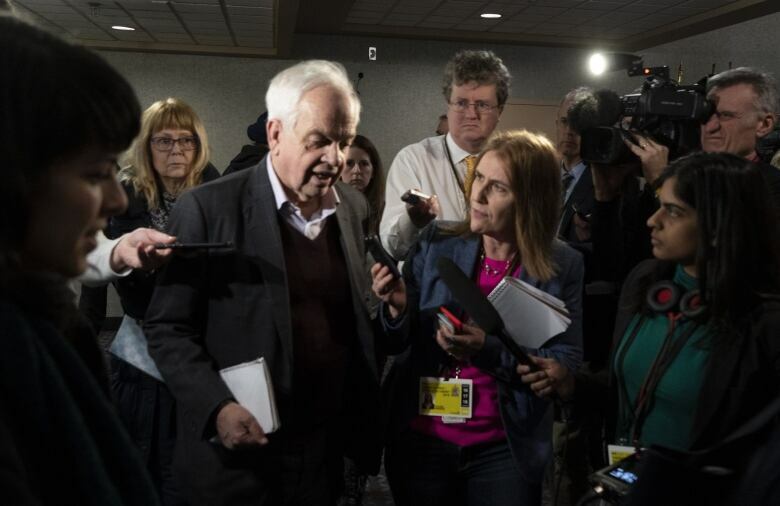 Former Canadian diplomat Colin Robertson, who’s now vice-president of the Canadian Global Affairs Institute, said McCallum’s firing was unavoidable. McCallum’s comments suggested just the opposite, lending credence to what Chinese had insisted all along — Meng’s arrest was political. It’s a devastating setback for Canadian diplomacy with China. When Justin Trudeau first met President Xi Jinping at the G20 summit in Turkey back in November 2015, Xi made a point of praising his father, Pierre Elliott Trudeau, for what he called his “historic engagement” with China in 1970. “China will always remember that,” Xi said. In sending McCallum to China in 2017, Trudeau was choosing a long-time cabinet member who had overseen the process of re-settling nearly 40,000 Syrian refugees. Yes, there were risks in appointing a politician who was never loath to speak his mind to the sensitive world of diplomacy where, as the American politician Lincoln Chafee once said, “some things are better left unsaid.” That just wasn’t McCallum’s style. He was a frequent guest on political talk shows. He was never one to duck a question. Unlike most diplomats, he never bought into the notion of talking without saying anything. But whatever those risks, Trudeau wanted the value of appointing a highly visible cabinet minister to Beijing. In doing so he elevated China to a status that had been reserved, previously, for the most important and high-profile diplomatic posts in Washington, London and Paris. Trudeau wanted closer ties with the world’s second-largest economy. McCallum’s job was to help make that happen. News reports of his appointment noted McCallum’s wife is Chinese. His old riding in Markham, Ont., is home to many people of Chinese descent. “I need my top people to be out there engaging at the highest levels around the world,” Trudeau said at the time. The marching order, as McCallum himself set it out, was more of everything: trade, investment, tourism, cultural ties. Those gains really never fully materialized. Canada did secure a tourism deal with China that made it easier for Chinese tourists to visit Canada. But the desire to commence formal free trade talks fizzled, despite the prime minister’s own visit to China in December 2017. A year later, Meng’s arrest on behalf of the United States as she stepped off a flight in Vancouver sent relations spiralling to new lows. The consequences of McCallum’s departure now are serious. Two Canadians, Michael Kovrig and Michael Spavor, remain in custody in China, accused of endangering national security, both arrested shortly after Meng was detained in Canada. A third Canadian, convicted in China of drug smuggling, had his 15-year jail term overturned and now faces a death sentence. Huawei arrest: What’s happening between Canada and China? McCallum’s predecessor in Beijing, Guy Saint-Jacques, said finding the right person now to represent Canada is critical. And whoever Trudeau chooses, it has to be soon. The lives of those three detained Canadians are in the balance. A successful resolution to that crisis, and to the Meng extradition, is paramount. Normalizing relations with a powerful nation such as China comes next. That job will include communicating to China what role, if any, Huawei will have in Canada’s 5G mobile network. The question now is where Trudeau will turn for his next ambassador. Saint-Jacques, for one, believes the next ambassador has to have a deep knowledge of China. Others add that McCallum’s successor needs to be fluent in Mandarin, which McCallum wasn’t, and should come from the senior ranks of the foreign service, rather than the front lines of the political world. Still others say the next ambassador must continue to have the ear of the prime minister. It all adds up to this. The next call between Trudeau and Canada’s ambassador to China will be initiated by the prime minister again. And it will be just as important as his last.